* Opens flat for "cash drawer" convenience. Patented spring clips in cover hold bills in place. Removable six-compartment molded plastic tray with storage underneath. 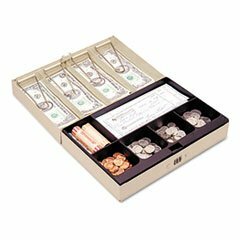 Cash Drawer/Box/Tray Type: Box; Carrying Method: Handle.